Stephen H. Lee has raised over $5 million to support USO programs for wounded soldiers. Wells Fargo (WFC) advisor Stephen R. Lee says he will gladly remember this July 4th. Just a few weeks before the national holiday, the Cincinnati-based registered rep received an honor at the Pentagon. 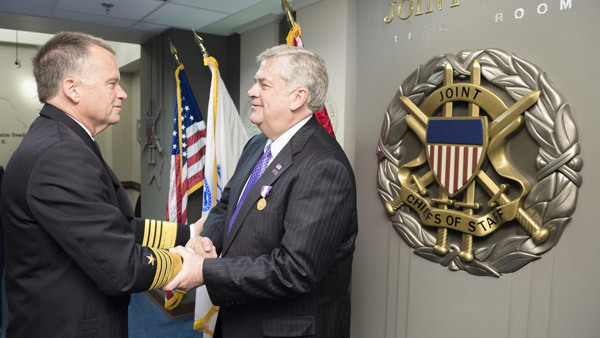 In fact, Joint Chiefs of Staff Vice Chairman and Admiral James A. Winnefeld, Jr., gave the advisor and philanthropist the Joint Chiefs’ Award for Distinguished Public Service for Lee’s raising of more than $5 million for the USO. “Though I didn’t serve in the military as a young adult … I always remember watching the Bob Hope shows at Christmas time. It was a ‘must see’ and built the framework for all I feel for the troops and the USO,” Lee said in an interview with ThinkAdvisor. The USO, also referred to as the United Service Organizations, has provided programs, services and live entertainment to U.S. troops and their families since 1941 in partnership with the Department of Defense. For his part, Lee has been an active board member of the USO of Metropolitan Washington-Baltimore (USO-Metro) for about 10 years. He has done most of his fund-raising in the greater Cincinnati area in order to support wounded, ill and injured service members receiving care at local military hospitals, as well as to assist their caregivers and family members. The advisor says he became focused on supporting the USO after watching a news program about amputees and other veterans staying at Walter Reed. He got together with a member of Congress – who also was a client – and others and started planning. “That TV show was on my mind – and when things are on my mind they stay there,” Lee said. “Freedom comes with a price, and when our country needs our military, the USO gives all of us in the civilian world a way to support service members and their families every step of the way – from home to the battlefield and to home again,” said Lee, in a press release announcing his award. “Though I am humbled and honored by the Department’s recognition, it truly is a reflection of the hard work and dedication of the volunteers, businesses and cultural organizations in Cincinnati and beyond that have come together to make new USO programs possible,” the advisor added.